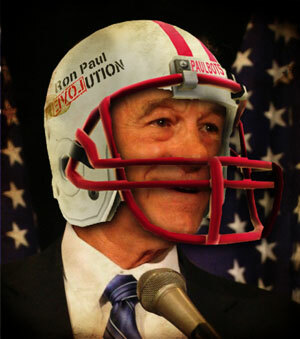 Monday Morning Quarterbacking With Ron Paul. In Monday’s debate, Ron Paul was asked about a statement he made to a Des Moines radio station. BAIER: In a recent interview, Congressman Paul with a Des Moines radio station you said you were against the operation that killed Usama bin Laden. You said the U.S. operation that took out the terrorist responsible for killing 3,000 people on American soil, quote, showed no respect for the rule of law, international law. So to be clear, you believe international law should have constrained us from tracking down and killing the man responsible for the most brazen attack on the U.S. since Pearl Harbor? The interview to which Baier is referring took place on May 11, 2011 with Des Moines, Iowa radio station WHO‘s Simon Conway. The interview was in several parts due to commercials and such, but the issue of foreign policy and the killing of Osama bin Laden comes up at roughly the 3:20 mark of the video below. CONWAY: Now if we take what you have said, then are you asking us to believe that a President Ron Paul could have ordered the kill of bin Laden by the entering of another sovereign nation. PAUL: No I think things would be done somewhat differently. I would just suggest that the way they got Khalid Sheikh Mohammed who was the real ring leader and the people who…….. He’s probably the ringleader on 9/11. And we went and cooperated with Pakistan and they arrested him actually and turned him over to us and he’s been in prison and a matter of fact, the same thing happened on the release of the people who had to do with the bombing in 1993 I believe, when they first attempt…. CONWAY: Yeah, the blind sheikh …..
PAUL: Yeah, and they were all captured and brought and tried in a civilian court and they’ve all been punished. So no, what’s wrong with that? So why can’t can’t we work with the government? CONWAY: I just want to be clear, a President Ron Paul would therefore not have ordered the kill of bin Laden which could only have taken place by the entering of another sovereign nation. PAUL: No, I don’t think it was necessary to do it. PAUL: It was absolutely not necessary and I think respect for the rule of law and uh… world…. uh international law. What if he had been in a hotel in London? I mean, should uh, you know, if we wanted to keep it secret, would we have sent the airplane, uh the helicopters into London? And because they were afraid the information would get out, no, you don’t want to do that. CONWAY: Well, I think you have been very clear sir, very clear, and I definitely do not want the bin Laden kill to take place as it took place in Pakistan. PAUL: Not the way it took place, no. PAUL: Obviously no. And that’s what — I did not say that. What I — as a matter of fact, after 9/11 I voted for the authority to go after him. And my frustration was that we didn’t go after him. It took us ten years. We had him trapped at Tora Bora and I thought we should have trapped him there. I even introduced another resolution on the principle of marque and reprisal to keep our eye on target rather than getting involved in nation building. First, as evidenced by the video and transcript above, Paul did say what Baier attributed to him. There can be no denying that or obfuscating that fact. Paul’s denial is false. Archaic. A letter of marque was issued by a nation to a privateer or mercenary to act on the behalf of that nation for the purpose of retaliating against another nation for some wrong, such as a border incursion or seizure. Archaic. An act taken by a nation, short of war, to gain redress for an action taken against that nation. For example, seizing a ship in retaliation for a seized ship. In essence, a “letter of marque or reprisal” was state sponsored piracy on the high seas. Congress was allowed to hire ships to act on behalf of the country. Such ships, known as privateers, were basically mercenaries of the ocean. In its history, the US did issue such letters to privateers. Supposedly, the US even issued a letter of marque and reprisal to two Goodyear airships at the start of World War II to patrol for Japanese submarines off the west coast. The last such issuance of a letter of marque or reprisal occurred in the United States during the War of 1812. The system of privateering was subject to extensive abuses. In the absence of proper letters, a privateer was tantamount to a pirate. Piracy is subject to severe punishment throughout the world. Although privateers allegedly existed in order to support the defense of their sovereigns, they frequently acquired much personal wealth through their activities. In addition, since privateers were not subject to the same discipline as a regular navy, they yielded to the temptation to seize ships beyond the scope of their authority. Such abuses, and new theories of naval warfare led civilized nations, in 1856, to sign an agreement outlawing privateering. The agreement does not prohibit a state from organizing a voluntary navy of private vessels, which are under the dominion and control of the state. Letters of marque and reprisal fell out of use in the world and were banned by international treaty by the Paris Declaration in 1856. Although the US was not a signatory of the Declaration, through the years the US has recognized the Declaration and its provisions. The Declaration is part of international law. Which brings us to the first “Monday Morning Quarterbacking” by Ron Paul. Paul says he would not have ordered the killing of bin Laden because of international law. He feels the killing was contrary to American law and the law of nations. He is entitled to that opinion. Instead of what happened, Paul said he would have proposed a “letter of marque or reprisal” which would have created mercenaries to go after bin Laden. The problem with his proposed course of action is that it violates international laws and treaties. The hypocrisy is amazing. Paul Monday Morning quarterbacks the action against bin Laden and condemns it, but proposes a course of action that would be condemned if he used the same standard on his own proposal. We believe Paul likes to use the term “marque and reprisal” because not many people have heard of it, and fewer know what it means. It makes him, and by extension those who support him, seem smarter than they really are. Instead, Paul and his supporters get caught in their own web of hypocrisy. The second bit of Monday Morning Quarterbacking happens in Paul’s attack on not getting bin Laden in Tora Bora. We are not going to delve into whether the action and the failure to capture bin Laden was Bush’s fault or not as that is somewhat disputed. What is not disputed and is a matter of factual record is that if bin Laden was in Tora Bora, the US along with Afghan allies, had surrounded him. Bin Laden was allowed to slip away though gaps in the perimeter when the Afghan units pulled back and or refused to close the perimeter. US commanders called for more US troops on the ground, and that call, while hotly debated in the chain of command, were not answered. The US paused at sending more troops into the area because they wanted to cooperate with the Afghan military units and government. To do otherwise would have been taking over Afghan security and assigned areas without consent of the Afghan government. In essence, the US would have been running the country. It would have been seen as a disruption to the sovereignty of Afghanistan. Yet Paul is upset because the US didn’t get bin Laden at the time. This means that Paul’s grievance with not getting bin Laden is there were not enough boots on the ground to do the job, even though more boots would have meant the very nation building and nation disruption Paul likes to whine about. Monday morning quarterbacking is easy as hindsight is always 20 – 20. With Paul, however, it is something different. It is a way for him to play both sides of the street. In his world, you can claim you would not have authorized an action against bin Laden because of international law, but would have instead pursued a course of action that was equally against international law. In Paul’s world he can claim the US should respect the sovereignty of a nation and at the same time be upset the US didn’t get bin Laden because of that very sovereignty. Sadly, people eat up what Paul is putting out, failing to see the hypocrisy and lies in Paul’s statements and history. In their minds they see Paul as some sort of genius when instead, he is no better than a carnival sideshow barker, asking people to see what he is saying with one face, while ignoring what he is saying with another. We know we will never convince the Ron Paul followers that he is a hypocrite and dangerous to America, so we can only hope to take that message to other people and hope the smart and insightful ones see the truth.